Front doors are an important part of any home and as such, need to have a number of qualities to ensure they’re suitable. Hardwood doors are one option and actually very popular among homeowners for a number of reasons. For a front door, you need excellent security, weather resistance, durability and above all, fantastic aesthetic appeal. And that’s exactly what a hardwood front door will give you. They look brilliant and you can even choose from a range of colours and amazing styles to create a unique appeal for your home. 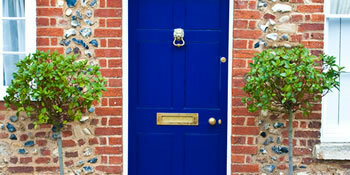 No matter your property, you could consider a Victorian, Edwardian modern or even country front door design. Then the colour could be range from a traditional black or white, to bolder red, green and blue. Hardwood doors are preferred over the cheaper uPVC option because they’re much more resilient and look excellent. They may set you back slightly more, but the extra cost is worthwhile when you consider the fantastic benefits. Benefit from superb weather resistance and excellent durability. Project: I need three replacement Victorian style doors as my property is over one hundred years old.The bathroom door and living room door are in bad condition. Homes are given an energy rating dependent on how efficient they are and ratings are shown in the information down below. This varies from A, the most energy efficient, to G, the very least efficient. With a higher rating you're more likely to have more affordable energy bills as more heat will likely be retained in your home. You'll be able to enhance your home's efficiency with insulation including upvc double glazing, loft lagging or wall cavity insulation. There are many types of home in the United Kingdom and the data below illustrates the type of homes within Uk. Over the country the most popular housing types tend to be semi-detached and terraced housing, however detached homes, flats and bungalows are also available. The information listed below provides an indication to the number of properties in Uk which are central heated and non-central heated. Properties are heated by a number of sources which reflect how expensive annual energy bills will likely be. Examples of central heating include gas, electricity, oil, solid fuel and LPG boilers. Changing the way your home is heated can see you with cheaper bills. The data beneath reveals the spread of homes warmed by various fuels. Throughout the UK the most common hands down are gas heated houses, followed by electricity and then oil. Biomass boilers are also rising in popularity, heated by sustainable products such as wood pellets or agricultural waste.|Properties in the UK are warmed by a number of fuels, including gas, electricity, oil, solid fuel and LPG boilers. Each fuel has a varying cost associated with it and that means you can find yourself with less expensive energy bills by switching how your house is heated. Even solar thermal panels are being regarded as by many people in order to reduce heating bills for the many years to come.